As the blazes we now know as the Mendocino Complex roared to life last month, Santa Clara County firefighters sent to the scene found themselves facing an unexpected obstacle: Verizon, their internet service provider, imposed a drastic limit on data speeds to and from their crucial mobile command center. The data "throttling," first reported Tuesday by the technology news site Ars Technica, forced Santa Clara County Fire Department firefighters to negotiate with Verizon for higher internet speeds while they tried to perform their intended function as a communications hub for incident commanders. 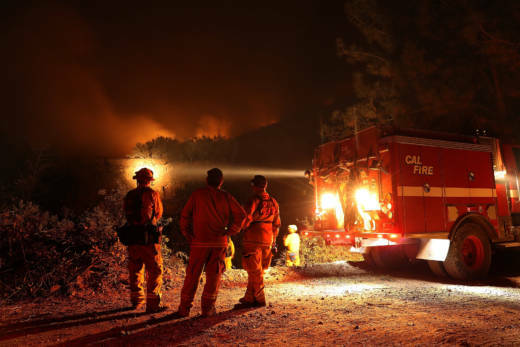 Verizon acknowledges that it limited data speeds to the command center, which was deployed to help fire commanders assign, track and communicate with firefighting forces. The company blames the issue on a "mistake" in communicating with the Fire Department and says full-speed access should have been restored because the agency was responding to an emergency. The throttling came to light in a declaration filed last Friday by Santa Clara County Fire Chief Anthony Bowden, written in support of a lawsuit seeking to restore internet neutrality rules repealed last year by the Federal Communications Commission. Bowden wrote that Verizon's throttling "has had a significant impact on our ability to provide emergency services. Verizon imposed these limitations despite being informed that throttling was actively impeding County Fire's ability to provide crisis-response and essential emergency services." Bowden's declaration is accompanied by email messages between Santa Clara County Fire and Verizon in the early phases of the Ranch and River fires -- which started in late July, grew quickly and forced thousands of people from their homes. Dubbed the Mendocino Complex, the blazes now rank as the largest wildfire in California history -- with the Ranch Fire having consumed nearly 360,000 acres in four counties and the River Fire charring an additional 49,000 acres. A Santa Clara County Fire Department command center vehicle had been deployed to the incident but experienced dramatic slowing in internet speeds compared to what firefighters were seeing on their own personal mobile phones. Data speeds for the command center's net connection slowed to as little as 1/200th its normal rate. That internet connection was so slow that Fire Capt. Justin Stockman reported to department officials "it has no meaningful functionality." The emails show firefighters alternately demanding and pleading for removal of the data throttling, and a Verizon customer representative suggesting that the department purchase a more expensive plan to ensure uninterrupted high-speed service. "Remove any data throttling ... effective immediately," Dan Farrelly, a Fire Department IT officer, wrote to Verizon representative Silas Buss on the night of July 29. The next morning, Farrelly emailed Buss again. "Please work with us," he wrote. "All we need is a plan that does not offer throttling or caps of any kind." Buss responded by recommending that the department sign up for a new plan to replace one that allowed data transmission speeds to be dramatically reduced after 25 gigabytes had been used in a billing cycle. "It's $99.99 for the first 20GB and $8/GB thereafter," Buss wrote. "To get the plan changed immediately, I would suggest calling in the plan change to our customer service team. ... Let me know if you have any questions -- I'll be available by phone for at least the next hour or so." In statements issued to media outlets after the Ars Technica article appeared, Verizon disputed that the throttling issue had anything to do with net neutrality regulations. Instead, it said the issue involved "a mistake in how we communicated with our customer about the terms of its plan." The company also acknowledged another mistake. "Regardless of the plan emergency responders choose, we have a practice to remove data speed restrictions when contacted in emergency situations," the company's statement said. "We have done that many times, including for emergency personnel responding to these tragic fires. In this situation, we should have lifted the speed restriction when our customer reached out to us. This was a customer support mistake. We are reviewing the situation and will fix any issues going forward."